In a desperate situation with several crises occurring at once as inspired by the approaching, world-destroying Mageddon, the JUSTICE LEAGUE puts out a call to all the heroes of Earth to lend aid against the crisis. Booster Gold and BLUE BEETLE II appear among the crowd of heroes who volunteer what services they can against the awesome, incomprehensible power of Mageddon. Frances Kane was once the girlfriend of TEEN TITANS member Kid Flash I (see FLASH) and despite episodes of mental instability was eventually accepted a role as an ally of the Teen Titans with the codename Magenta. 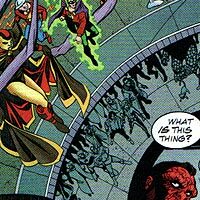 When the Teen Titans were brainwashed by Brother Blood, Magenta sounded the alarm that caused several other heroes to come running. Among those responding to the alarm was Booster Gold, in his first group team-up as a super hero. 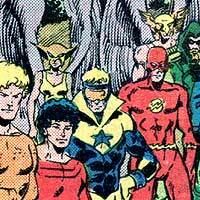 The next time that Booster would encounter the mentally-unstable Magenta, many years later, she would be aiding villains (see WEDDING CRASHERS) during the wedding of Green Arrow (see HEROES OF THE MILLENNIUM) and Black Canary II (see JUSTICE LEAGUE). Deceased Marine Lance Corporal David Reid was resurrected by the deity Gog to do his bidding. Turning on his evil benefactor, Magog joined the JUSTICE SOCIETY OF AMERICA to defeat the menace that Gog posed to Earth. It is possible that Magog will one day cause a schism between the heroes of Earth, as his namesake did on Earth-22. Booster Gold has reason to believe that Magog will one day in the future cause harm to RIP HUNTER and SUPERMAN. Booster was not reassured by Magog's behavior when the two defeated Dvorcek and his fellow terrorists together in the African nation of Khandaq. Prior to ever meeting Magog, Booster had previously been defeated by Gog II, another mortal also corrupted by the power of Gog, while assisting Superman. The full details of that encounter have yet to be revealed. 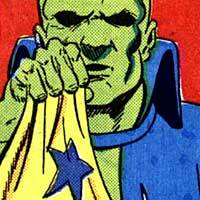 J'onn J'onzz is one of the last survivors of the Martian race, unintentionally kidnapped from Mars by scientist Doctor Erdel. Adopting Earth as his new home, he uses his remarkable inherent powers to prevent the sort of cataclysmic apocalypse that destroyed Mars to befall Earth as the Martian Manhunter. Manhunter has been willing to battle his the evil kindred, the white martians, and even the gods of Mars themselves, including the Martian god of life, H'Ronmeer, to defend his adopted planet. For a variety or reasons, Manhunter at times adopts alternate personalities (see BLOODWYND). A founding member and staple of almost every incarnation of the JUSTICE LEAGUE, Martian Manhunter was the frequent field leader of the Justice League International. As a paternal authority figure, he has traditionally been very supportive of Booster Gold. Ironically, Martian Manhunter was the first Justice Leaguer to battle Booster Gold. At the time, Booster was under the influence of a sentient cell (a bio-engineered microorganism). Responsometer technology invented by genius Doc Magnus provides artificial life to several androids composed of various metals. As the Metal Men, these lifelike androids use their unique powers to assist the heroes of the world. Booster Gold first fought beside (and against) the Metal Men when all were HEROES OF THE PANIC IN THE SKY led by SUPERMAN against BRAINIAC. When the Oans Herupa Hando Hu and Nadia Safir (see GUARDIANS OF THE UNIVERSE) arrive on Earth to accelerate the evolution of humanity during the Millennium event, the heroes of Earth are asked to defend the Chosen (see NEW GUARDIANS) from the MANHUNTERS. This event is Booster Gold's first truly large-scale event, and for the first time he finds himself among the elite ranks of the heroes of Earth, surrounded by the very heroes that he has returned to the 20th century to join. Scott Free is the son of Highfather, leader of the NEW GODS, who was raised by DARKSEID following a treaty stabilizing relations between the respective planets of Highfather and Darkseid. Escaping to Earth with his wife, Big Barda, Scott Free developed a public reputation as master escape artist Mister Miracle I, a title that he has passed to his protégé Shilo Norman (as Mister Miracle II). 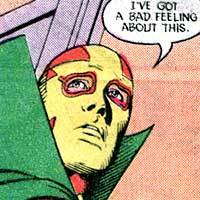 Mister Miracle is often accompanied by his assistant, Oberon, who also often lent his time to the JUSTICE LEAGUE. 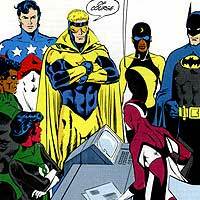 Booster Gold was introduced to the first Mister Miracle when both heroes were simultaneous members of the Justice League. They developed a friendship, and for a time, were very close before Miracle's apparent demise courtesy DESPERO. In this case, Miracle cheated death by not being present; his Cluster (see MANGA KHAN) replacement, a Mister Miracle Robot, was obliterated in his place. 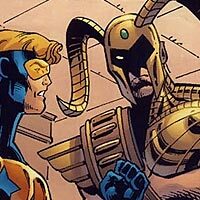 Booster Gold and BLUE BEETLE II were frequent guests at Miracle's homes, even meeting his neighbors such as Ed Ferbel. In recent years, the two have drifted apart, meeting only occasionally during major crises. Booster has never been formally introduced to Scott's successor, Shilo.